The Tuo Jiang is a step in the right direction. However, a 20-year modernization plan for Taiwan’s armed forces fails to recognize the need to switch from a sea-control to a sea-denial navy. No sooner had the new missile corvette come into service on Dec. 23, 2014 than it became the object of controversy because its name, Tuo Jiang (since it is the first vessel, the class will bear that name), is that of a river in Sichuan, China. It is certainly odd to name a warship after a river in a country that is a principal, if not the only, threat to Taiwan. However, the name controversy should not overshadow the importance of the new acquisition. The Tuo Jiang is a capable vessel of the type that Taiwan needs the most — fast moving, radar evading, and armed with guided missiles. It is also a demonstration of the prowess of Taiwan’s indigenous shipbuilding and weapons system research and development. The Tuo Jiang, created under the “Swift Sea” program, is a 500-tonne displacement vessel capable of reaching speed 38 knots per hour (~70kph). It packs a powerful punch, with eight Hsiung Feng (HF-2) subsonic anti-ship missiles (ASM) and eight Hsiung Feng 3 (HF-3) supersonic ASMs. This gives the boat twice the firepower currently found on Kidd-class destroyers and Oliver Hazard Perry-class frigates. 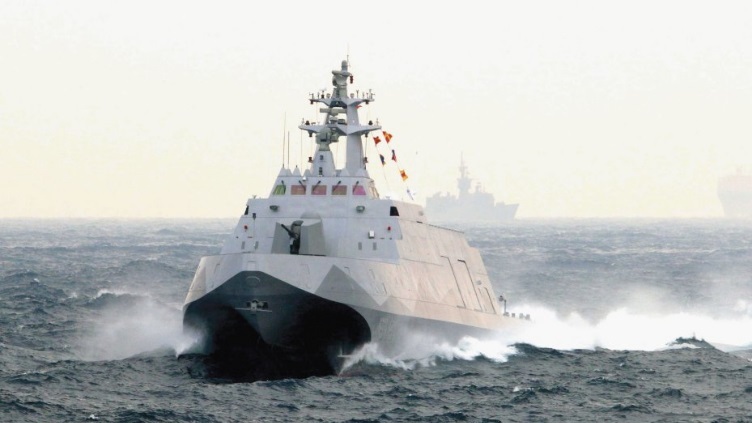 The new corvette is stealth capable, meaning that while it won’t be invisible to People’s Liberation Army (PLA) radars, its reduced cross-section will make it look like a much smaller vessel, making it possible for the Tuo Jiang to pass off as one of the myriad fishing boats cruising the waters around Taiwan. In addition, the ship is designed as a wave-piercing catamaran, which gives it additional stability —a useful feature for the rough waves in the Taiwan Strait. Design-wise, it is reminiscent of China’s Type 022 (Houbei class) fast missile catamaran. The Houbei carries eight sea-skimming C-801-type ASMs and is one of the backbones of the PLA Navy’s (PLAN) sea-denial fleet with the intended mission of swarm-attacking U.S. Navy carrier battle groups. Both the Tuo Jiang and Type 022 are typical asymmetrical platforms: In a combat situation they would not face each other; instead, they would be used against more valuable surface assets. The media have nicknamed the Tuo Jiang a “carrier killer” (a term also used for the HF-3 missile), but that is misleading. Although some analyst remain obsessed with the idea of aircraft carriers operating within the Taiwan Strait, such deployment do not make sense as it would expose high-value vessels to shore-based fire without enhancing one’s capabilities in the theatre of operation. In other words, whoever sends an aircraft carrier into the narrow Taiwan Strait risks losing it in the early phase of hostilities. The PLA in particular does not need to deploy an aircraft carrier in the Strait, as Taiwan is well within combat range of PLA Air Force (PLAAF) aircraft deployed in the Nanjing Military Region. 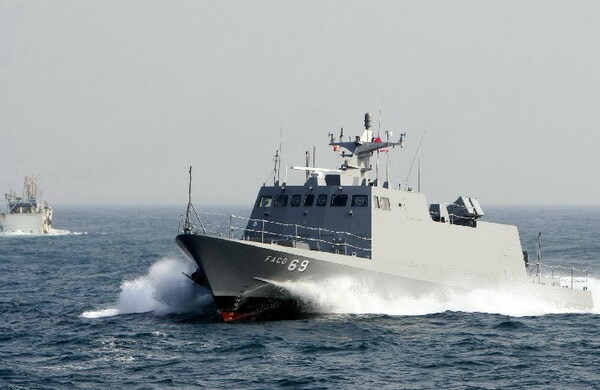 The Tuo Jiang is a welcome acquisition beefing up the fleet of 31 Kuang Hua VI-class (KH-6) missile patrol boats, which are armed with four HF-2 ASMs. As a combat platform, the Tuo Jiang promises to enhance Taiwan’s defense deterrent and to do so affordably. It is also evidence that Taiwan can deploy domestically built weapons systems that can compete with platforms made elsewhere. However, as James R. Holmes, a naval strategy expert at the U.S. Naval Warfare College, notes in his piece for The Diplomat, having a capability and using it properly two different things. Holmes has been a longstanding advocate of Taiwan’s Navy transition from a sea-control to a sea-denial fleet. In his 2010 report for The Jamestown Foundation (co-authored with Toshi Yoshihara), Holmes urged the Taiwanese Navy to resist any temptation to tie fast missile boats to Surface Action Group (SAG) as escorts. In peacetime, the Navy is responsible for patrolling the Taiwan Strait, maintaining marine safety, and supporting disaster relief in all areas. In wartime, it will conduct maritime operations with friendly forces to counter the enemy’s maritime blockade or military invasion, thereby securing the sea lines of communication (SLOC) and ensuring national security. Countering a maritime blockade or a military invasion are the two most urgent scenarios facing the Taiwanese Navy. However, how to counter these and secure its SLOCs, when the PLAN is in a position to impose a distant blockade in South China Sea, remains unclear. What are the future prospects? In October 2014, the Ministry of National Defense unveiled its 20-year naval modernization plan, which plans for a fleet of four 10,000-tonne destroyers, ten to fifteen 3,000-tonne catamaran frigates, amphibious transport docks to replace 11 dock landing ships and tank landing ships, and four-to-eight diesel 1,200-3,000-tonne submarines — all domestically produced. Granted, the details of the modernization program are limited, and there is no mention of vessels with displacement under 1,000 tonnes. In other words, it is not specific on how many stealthy missile corvettes and smaller vessels (future replacements for the KH-6) will be introduced. As it stands, the replacement of the current four Kidd-class destroyers and 10/6 Perry-class and Lafayette-class frigates suggests that a future Taiwanese Navy will still be built around the SAG concept. Be it as it may, an indispensable part of the process must be the substantial expansion of the current sea-denial fleet based on 31 KH-6 patrol boats and the 12 planned Tuo Jiang corvettes. The positive side of the modernization plan is the intent to domestically build up to eight submarines — the optimal sea-denial platform. Such plans have received the approval of both sides of the political spectrum. In the pursuit of a sea-denial capability, the Tuo Jiangs, HK-6s and other fast-attack boats will need to be given operational autonomy (which among other things means freeing those vessels from dependence on land-based sensors) to be able to engage an invading fleet. Moreover, while this may be difficult to swallow for the Taiwanese Navy, big surface ships aren’t the solution to countering an amphibious invasion by China. A surface fleet centered around Kidd-class-led SAGs may play a supporting role in keeping SLOCs east of Taiwan open, operating beyond the reach of the PLAAF, provided that once the shooting starts the naval bases in Keelung, Tsuoying and Suao remain operational. However, sending SAGs closer to the Taiwan Strait would be tantamount to a suicide mission. Meanwhile, denying its sea-denial fleet the ability to operate independently of SAGs would diminish the fleet’s potential while providing no particular benefit for the larger surface combatants. Granted, missile boats would be operating in a very dangerous environment, and many would likely be lost. Still, those ships, free to engage at will, unrestrained from SAG support duty, are more likely to impose a high cost should Beijing decide to take Taiwan by force. The best thing the Taiwanese Navy and the Ministry of National Defense can do would be to scrap their plans for four new destroyers altogether and instead invest more resources into building more Tuo Jiang-like vessels. Heeding Holmes’ advice, Taiwan does not need to control the sea surrounding it; it does not need it and, more importantly, it is beyond its reach. However, denying the sea to the PLAN, making the environment prohibitively dangerous for a slow-moving and vulnerable invasion fleet — now that is an entirely different matter. This piece was originally published on Thinking Taiwan on 6 January 2015.